These small and delicious smoked salmon rolls with avocado cream are perfect as a starter, a snack or maybe as a part of a tapas dinner. 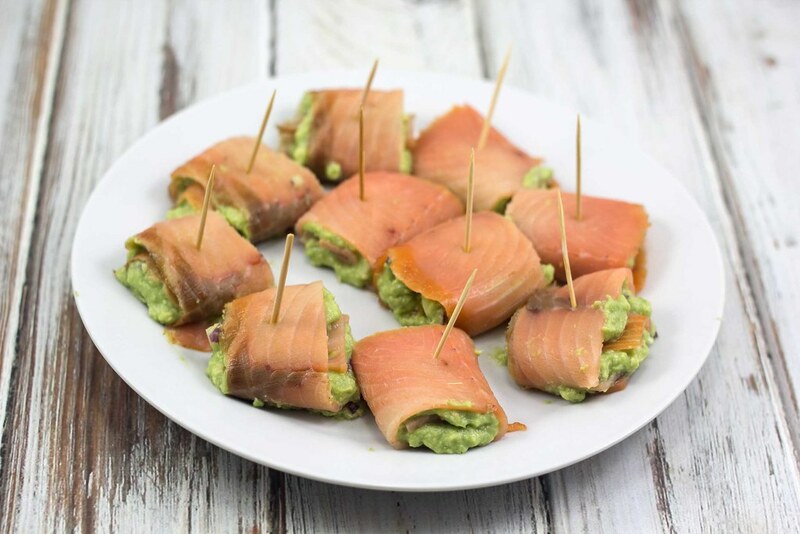 We both love avocado – the avocado cream in this recipe has chopped red onions and lemon juice and it goes perfectly together with the smoked salmon fillet. They are super easy to prepare. We made these 10 rolls in about 10-15 minutes and then served them together with some other tapas dishes. If you are looking for inspiration for other tapas dishes we have an archive, on this blog, with great tapas recipes. 1. Peel the avocado and mash it in a bowl with a fork. 2. Peel and finely chop the red onion. 3. Mix the chopped red onion with the mashed avocado. Add some lemon juice and salt and pepper to taste. 4. Using a tablespoon; place some of the avocado cream on a thin smoked salmon fillet. 5. Roll the salmon around the avocado cream and secure with a toothpick or similar.